Undertaking an electricity comparison in Sydney and New South Wales is a challenging task. While the New South Wales electricity market is heavily scrutinised by the government-run AER, it is perhaps one of Australia’s most confusing markets to fully grasp and understand with so many distributors and retailers operating within the state. For each distributor, each household and business will have a different tariff and a different rate structure depending on the type of meter. Various retailers operate within each distribution area. Each of these retailers will have their own plans with different rates for peak, shoulder, or off-peak usage as well as various discounts and other pricing arrangements. Your electricity bill is made up of two main costs – the usage charge and the supply charge. These rates can vary dramatically depending on where you live, and the unfortunate truth is that residents closer to Sydney are charged less for their electricity use than residents in rural NSW. This is due to the increased costs of supplying electricity to rural areas. What is a Single Rate Tariff ? A single rate tariff means one set rate for your usage, no matter the time of day or night you’re using your electricity. These are generally higher than other tariffs and are less common with the introduction of smart meters. What is a Controlled Load Tariff? Controlled load tariffs apply to single appliances that generally have their own electricity meter. Things like electric hot water systems, underfloor heating, and your pool pump are likely to be on a controlled load tariff. If controlled load tariffs are available, they will often be significantly lower than other usage rates. What is a GreenPower Tariff? Many electricity retailers are beginning to offer Green Energy plans which allow consumers to choose carbon offsets or renewable energy generators. These plans typically allow users to choose to have between 10% to 100% of their supplied energy generated from renewable energy sources like wind, hydro, or solar. This means that customers pay a few cents extra per kWh depending on the amount of sustainable energy they want to use. What are Feed-in Tariffs? These rates only apply to customers with solar panels who might receive a small credit on their bill for each kWh of electricity their solar system delivers back to the electricity grid. What is a Standing Offer? The default pricing structure published by energy retailers is usually their highest priced plan. If you were automatically allocated to an electricity company when New South Wales was deregulated, you would have been placed on a standing offer. 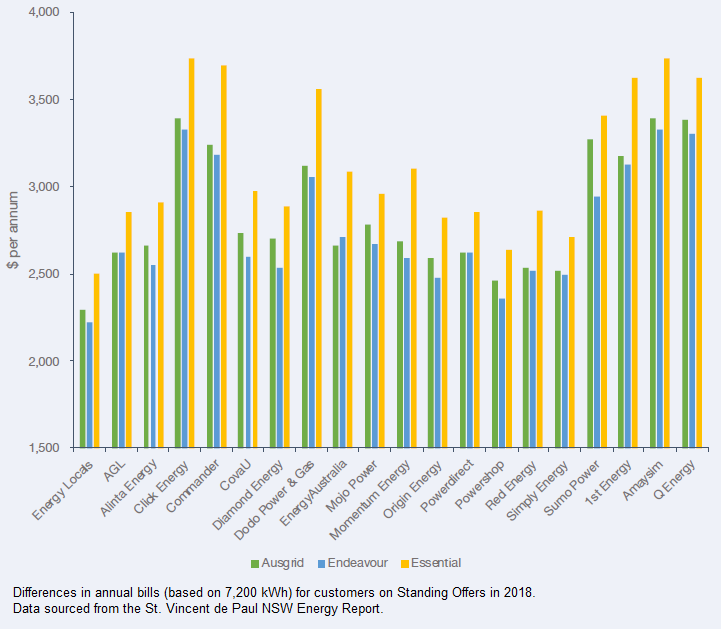 Default Standing Offers vary greatly across the different electricity networks and between electricity companies. In NSW, 26% of customers have not taken the time to switch to a better market deal, and these customers are paying far too much for their electricity. 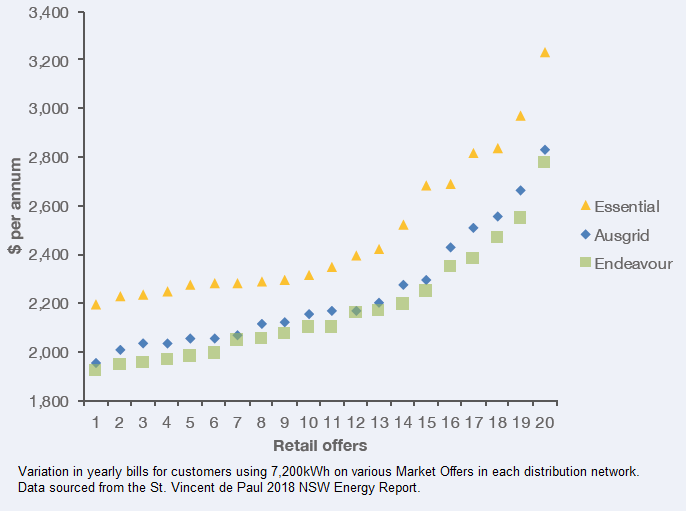 The 2017 Tariff Tracking project found that a household in NSW using an average of 7,200kWh per annum would save between $550 to $700 a year (depending on their network area) if they switched from the default retailer’s standing offer to the best market offer. What is a Market Rate? Because of increased competition in the electricity industry, market offers have the potential to deliver huge savings. These rates tend to offer a range of discounts depending on payment methods, paying on time, bundled energy, or a range of other options. Energy users will find there’s often a difference of several hundred dollars between a company’s Standing Offer and their best Market Rate. The various plans and market rates offered by these suppliers constantly changes. In July 2018, the Tariff Tracking project found a huge variation in offers across each network in NSW. Consumers that shopped around had the chance to pay far less on their yearly bills. Going through all these suppliers to find one that suits you might seem like a daunting task. But it doesn’t have to be. Electricity Wizard monitors changes in the various market rates and usage charges to make sure our customers get access to the best deals. By comparing companies and looking to see what plans offer the best benefits to suit your circumstances, you can start to save on your energy bills. We’ll help you get a smarter, easier electricity comparison in Sydney and NSW. Save time and money by letting the experts find you the best plan from recommended electricity companies to suit you. Electricity Wizard will compare your electricity company and find you the cheapest electricity prices in NSW. Call Electricity Wizard now on 1300 359 779 or fill in the form, and we’ll call you straight back.